4 WHAT MAKES US SUSPECT IT? 6 AT WHAT POINT ARE WE COMFORTABLE IN MAKING A DIAGNOSIS? 7 HOW DO WE TREAT IT? 8 HOW WELL DO THE PATIENTS DO? 9 WAS THERE A WAY TO PREVENT IT? 10 WHAT ELSE ARE WE WORRIED ABOUT? 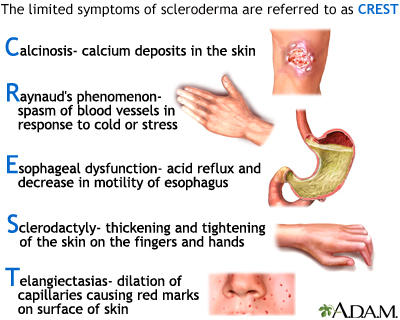 Diffuse scleroderma: which involves widespread skin involvement. Any organ system can be involved however the esophagus is common. While the exact cause is not fully understood, it is believed that mutations in HLA genes seem to often play a crucial role in the pathogenesis in some forms of this condition (given this is an auto-immune disease). Furthermore, through some process, this condition is characterized but the increased synthesis of collagen (that leads to sclerosis, damage to small blood vessels, activation of T-cells, and altered connective tissues). This process of systemic sclerosis can lead to various complications that can involve various organ systems (renal, pulmonary, cardiovascular, and GI) depending upon where exactly he collagen has been deposited. Dysphagia can be a common complaint (due to the esophageal dysmotility). Dysphagia typically involves difficulty swallowing both solids and liquids. Serological analysis: the presence of autoantibodies are not necessarily diagnostic, but can be associated with a diagnosis. Anti-Scl-70 antibody presence in patients is associated with diffuse scleroderma. (This is an antibody against anti-DNA topoisomerase I). Anti-centromere antibody is associated with limited scleroderma. AT WHAT POINT ARE WE COMFORTABLE IN MAKING A DIAGNOSIS? The American college of rheumatology/European league against rheumatism collaborative initiative has a very defined set of criteria that they use to diagnosis scleroderma (outlined here). With this in mind, let us not forget that it truly is the clinical presentation that helps make the diagnosis of scleroderma. HOW WELL DO THE PATIENTS DO? WAS THERE A WAY TO PREVENT IT? WHAT ELSE ARE WE WORRIED ABOUT? Barrett esophagus can be caused due to acid reflux in patients with esophageal dysmotility/involvement.